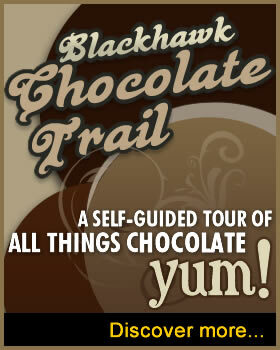 For those who enjoy the great outdoors, the Blackhawk Waterways region is the place to be! Consider this: within our four-county region, there are six state parks, preserves and wildlife areas, and a state forest . . . totaling over 14,000 acres of state-protected natural splendor! At nearly 2400 acres, Big Bend is one of Illinois’ largest fish and wildlife areas. Popular with hunters, hikers, photographers and outdoor enthusiasts, Big Bend combines uplands with wetlands, marshes, bottomland and two oxbows totaling 96 acres of water. Interspersed are native grassland, tree plantings and tracts of woods. Annual food patches are scattered over the area and fields of sunflower, corn, and soybeans are planted and left standing through the winter. Castle Rock State Park is located three miles south of Oregon on Highway 2. The park is centrally located in the Rock River Hills region of Illinois, and its rolling topography is drained by the Rock River. Rock formations, ravines, and unique northern plant associations are found here. A sandstone bluff, adjacent to the river, has given the park its name. The beautiful Franklin Creek flows throughout the 664-acre park and includes several large natural springs, hardwood forests, bedrock outcroppings, and a large variety of flora and fauna comprise a pristine ecosystem. Also here are horseback/equestrian trails, hiking trails, hunting, fishing, and the Franklin Creek Grist Mill. The Green River State Wildlife Area is a wildlife restoration area popular among hunters, hikers, birders and other outdoor enthusiasts. Topography of the 2,565-acre area varies from flat to gently rolling. Swampy slough areas dominate nearly a third of the acreage, but the remaining portions are prairie restorations, open fields, cultivated areas or timberlands. Many of these areas have been specially planted and managed to provide more food and cover for a variety of wildlife species. Native prairie plants are found in many portions of the Green River Area. The Hennepin Canal State Parkway extends from Rock Falls to Sheffield IL. The Hennepin Canal Feeder opens the door to the parkway with miles of bike and hiking paths, canoeing, fishing and historical sites along the way. At the mouth of the feeder is Rock Falls' Hydroelectric Plant completed in 1988 and is the first such constructed in Illinois since 1927. 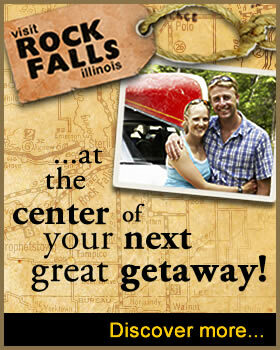 Enjoy biking, hiking, fishing, boating & canoeing. Legend has it that Chief Black Hawk, as he left the area after the Black Hawk War, talked of the beauty of the area and admonished his captors to care for the land as he and his people had. Lowden State Park (207 acres) was established not only to care for the land but to allow visitors to share in the beauty as well. This 2225-acre forest offers 22 miles of maintained trails for hiking and horseback riding. In the winter, snow transforms the trails into excellent cross-country skiing trails. 120-foot bluffs along the Rock River highlight this forested beauty. The Native American pathfinders along the rock palisades of the Mississippi River did as present-day hikers do in coursing the bluffs — they took the paths of least resistance. The trails at Mississippi Palisades, especially the park’s southern routes, put you in touch with the past. Walk them and you’ll trace the footsteps of all those who came before you, some of whom came this way nearly a thousand years ago. Located near the confluence of the Mississippi and Apple rivers in northwestern Illinois, the 2,500-acre Mississippi Palisades State Park is rich in American Indian history, as well as sheer natural beauty and tranquility. A trip to picturesque Morrison-Rockwood State Park, 1164 acres, offers many memorable experiences. 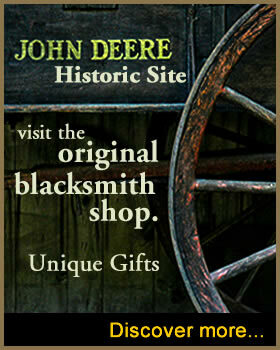 A large sign in the shape of Illinois, fashioned from angle iron by a blacksmith, greets visitors at the entrance. 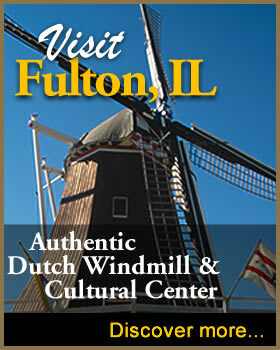 Once inside, choose from a variety of recreational opportunities. Beautiful Lake Carlton, a stream-fed reservoir, features an abundance of ducks and geese, and is considered a prime location for fishing. Or, plan a family outing at the Lakeview picnic area, or just do some bird watching among the hickory, ash, oak and walnut trees. Prophetstown State Park, on the northeast edge of the city along the south bank of the Rock River is a scenic and historic area offering a variety of recreational facilities: hiking, camping, fishing, picnicking, and more. Once the site of an American Indian village, the 53-acre park derives its name from the Native American prophet Wa-bo-kie-shiek. Located in the heart of the Rock River valley, this charming 385-acre park is the south boundary of the old Chicago-Iowa Trail. History tells us that this was for years the principal route east and west across the northern part of the state. Today the park provides the perfect recipe for family getaways. There are plenty of outdoor recreation activities, such as hiking, fishing, camping and picnicking. With lots of serene, picturesque beauty, and modern lodge facilities amidst a beautiful forest, there is no better way to retreat from the everyday routine than to re-discover yourself and your family among the open spaces at White Pines.